It's easier than you think to make this copycat "Spaceship" at home! This is one of my favorite copycats to make. I am going to have an updated version posted soon (it's April 2017 and I'm updating old posts with little to no words) in a whole new post because it took me many years to figure out how to brown it without messing it up completely. Hence the non-browned picture here! Plus a commenter was kind enough to tell me exactly how Taco Bell does it and it was much appreciated to have the lowdown on the proper way to make it. A ridiculously easy, delicious dessert that is super fun for the whole family. I have always loved dirt pudding. I think it's one of the most adorable and fun desserts out there and I know my kids think it's so awesome when I make it. This one is easy to throw together and it's rich and fluffy. Gummy worms are a must, so don't forget them! This Tex Mex chicken is perfect to top some rice or roll up in a tortilla. I have made this slow cooker chicken recipe a thousand times over. It's probably my favorite Tex Mex recipe I've tried. I love that you just have to slice up the chicken and peppers and throw them into the crockpot with some of the other ingredients. It can be cooked for 6 to 8 hours or 3 to 4. You can serve it over rice, which is my favorite way to eat this particular recipe, or you can serve it in a tortilla. This recipe is courtesy of my friend, Jessica. This total comfort meal is ready in under an hour to warm your belly! This is definitely such a throwback meal for my little family. When I was first married, I made the box meals where you mix everything together and bake it. I loved them back when they first came out and still love them. But you can definitely make more if you do it it semi-homemade. I would love to take this chicken and biscuits meal, that is very reminiscent of chicken pot pie, and make a more homemade version than this. Still, it is a wonderful meal to throw together and bake when you want a good comfort meal that sticks to your ribs! Strawberry and yellow swirled cake stacked and topped with Cool Whip and berries galore! This is my take on a recipe called Triple Berry Cake - mine differs a little :) It's great for Fourth of July - being red, white and blue! I took strawberry and yellow cake mixes and swirled them together. Then topped the whole thing with Cool Whip,fresh berries, and raspberry preserves. This was actually made for Nick's birthday way back before I started my blog, so I definitely need to remake it and get a picture without flash. This sweet and sour stir fry is an easy, but outrageously delicious pork dish! I love simple dishes like this sweet and sour pork recipe. I don't know why, but we don't eat a ton of pork. Maybe I've just had bad luck with finding good pork recipes (if you have a favorite, leave me a comment!) but the ones I have found I really love. This one is one that I could eat weekly. Plenty of garlic. Loads of veggies. Pineapple. That's the stuff! No skillet required for this oven baked Denver omelet! This is one of my favorite types of omelets -- a Denver omelet is also referred to as a southwest or Western omelet. It contains ham, onion, and green bell pepper. It took me such a long time to figure out how to do an omelet folded up like a quesadilla without messing it up. I still have yet to make one the proper way all rolled up delicately, but this is such an awesome cheat. Make it in the oven. It's more of a bake than anything, but regardless, it's the best. It's so easy and simple to throw together and then you just stick it in the oven and let it bake. That's it. Slice and serve. Too easy, right?! No rolling tortillas up, this chicken tortilla bake is reminscent of enchiladas without all the hassle. Peanut butter cookie dough plus peanut butter cups equals a peanut butter lover's dream! I highly suggest a glass of milk with these Peanut Butter Lover's Candy Cookie Bites. I made around 6 or 7 dozen with 3 pkgs of cookie dough. I have almost a full bag of Reese's cups left. I got a bag of cups per tube of cookie dough just to be sure. :) And be super careful...they are incredibly delicious and may be habit-forming!! 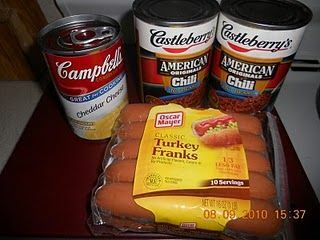 These chili dogs are a perfect non-hassle recipe to make for a crowd -- all done in a crockpot! I think it's genius when people come up with crockpot recipes that I would never in a million years have thought to try. This crockpot chili dog recipe is one of those. It's fast and you can easily double it (maybe even triple it - if you try triple the recipe, let me know if it works in a standard size crockpot!). If you are looking for a recipe that can feed a crowd - whether it's a birthday party or a football game gathering, this recipe will become your go-to. The combination of cookie dough and brownies topped with a decadent Nutella or milk chocolate frosting - all in one little bar! Customizable packets that are basically a mini meatloaf dinner -- perfect for everyone in the family to get what they want. 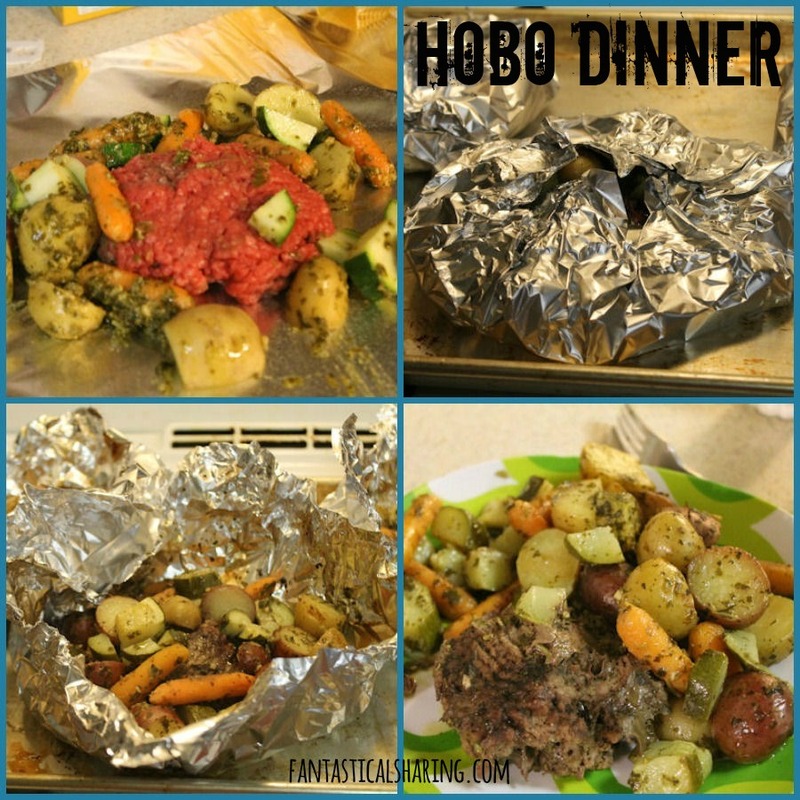 Hobo Dinner is one of our all-time favorite meals and I've made it more times than I can count. Recently for my picture retake, I decided to try out tossing the veggies with pesto and just seasoning the patty with salt and pepper. It turned out amazingly and I will definitely being doing it that way again. My favorite veggies to put in mine are potatoes, carrots, and zucchini. You can make it with red potatoes, gold potatoes, or russets. You can throw in pearl onions. The possibilities are endless. It can be served up with various condiments - we used to eat ours with ketchup, except for Nick who had buffalo sauce with his. Perfectly soft, perfectly chewy and packed with M&Ms! These have got to be the BEST cookie recipe ever. I, in fact, say it may surpass my mom's molasses cookie recipe. Sshh! Don't tell her I said that :) It's my go-to for any M&M cookie craving. They keep amazingly which can be any issue with some "soft" cookies. My tried and true tuna noodle casserole recipe that is cheesy and oh so comforting! This is classic tuna casserole with a little extra love...and by love, I mean CHEESE! After years of making tuna noodle casserole, I figured out which variations of ingredients made the best combination (or at least our favorite combination). First, I love cream of celery instead of cream of chicken. I don't know why but it just really works. Second, shell pasta is a must because it really grabs and holds the flavors of the casserole. They are the perfect vessels for flavor! Lastly, loads of cheese makes the whole thing perfection! I love peas in my tuna noodle casserole and tend to prefer frozen peas over canned peas. If I do frozen peas, I toss them in with the pasta while it cooks. Update 2/2/13: One of my all-time favorite recipes that is my own. I crave this all the time! Recently we tried this good ole favorite with homemade cream of celery soup, so I got a couple new pictures. It was incredible with homemade. I also used sharp cheddar, which I highly recommend. This pancake recipe is tried and true by a man named Pete's family -- and now my family too! I think this is my last recipe blog for the week. Next week, I should have one for every day! This cheddar broccoli soup is hands-down my family's favorite soup. Nothing has come close to beating it! I have never met a cheddar broccoli soup that I have liked more than this one. It takes the cake. I have wanted to try and replicate the double cheddar sauce because I'm afraid Ragu will stop making it and I won't be able to make my favorite soup anymore. But so far, I have struck out on that venture. Nowadays, I make this without pureeing the veggies and with fresh broccoli and tons of it. Still love it just as much as the first time we had it. Recipe update 1/23/2011: Another good way to prepare the soup is by puree-ing the soup after adding the broccoli florets into it (you may have to do this in a couple batches). The Panera Broccoli Cheese soup that I tried did that. I personally love the big chunks of broccoli in my soup, but it might be a way to get my 3 y/o to actually eat the broccoli. Updated 12/18/2015: Sometimes I am super lazy and don't puree anything at all. It still turns out tasting fabulous and dirties one less contraption in the kitchen!